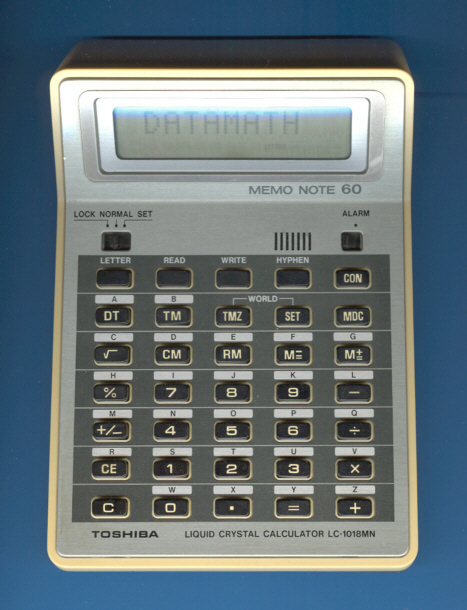 This Toshiba LC-1018MN MEMO NOTE 60 is based on the LC-1038MN MEMO NOTE II introduced already in 1979. The capacity of the internal memory was doubled, allowing to store 60 information items of 10 characters and 10 digits, each. The LC-1038MN uses an early chipset manufactured by Toshiba, Japan. We found similiar chips in the related LC-1019MN. © Joerg Woerner, October 19, 2008. No reprints without written permission.